"The landlord at Pier 39 has rigorous quality standards, and American Canvas and Awning met and exceeded them with a full storefront of complicated awnings on a tight time table. Very skilled and proficient crew and very competitive pricing. I had a great experience and I recommend them." 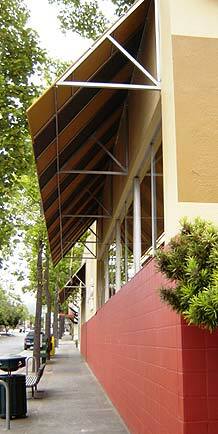 "American Awning did more than the canopies at Marin Suites. When our president wanted an artistic, tent-like effect in our outdoor lobby to create a feeling of sanctuary, Tim McGill did a great job... responsive, timely, and certainly reasonably priced. I recommend them." “I have been using Tim at American Awning for over 25 years. Always great working with you, Tim! "Our fathers started working together more than 30 years ago and Tim McGill is still the go-to guy for our design-build contracting business. He works with our architects on design and delivers prompt, quality fabrication and installation at a reasonable price. Our recent work includes Mollie Stone's and Lunardi's." – Steve Berringer, Sutti Assoc.